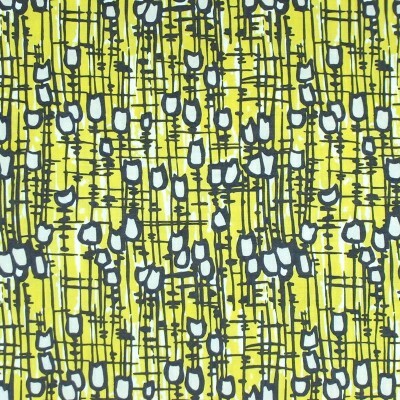 The first one is my favourite as it manages to combine tulips, crosshatch and yellow all in one go. The last one is probably the one I'll buy though…. I've already got visions of a shirtdress. Now to the chance encounter in the title of this post…. another event that Wayne Hemingway organises is the Classic Car Boot Sale which took place last weekend at the Olympic Park. My boys were keen to try out the Olympic pool and I like nothing better than mooching around a car boot sale, so off we set for virtually the entire length of the Central Line. Just as we approached central London, a man got on the tube with a dog. Charlie is a bit nervous around dogs, so whilst I was reassuring him of its friendliness, the man started chatting to us. "Is that Wayne Hemingway?" Jon murmured out of the side of his mouth. "YES!" I replied, just slightly over excited! The man (let's call him Wayne) asked where we were off to. We mentioned the Classic Car Boot Sale and then got chatting about lots of things: his new fabrics (naturally), 'Oh, You Pretty Things' on BBC4, dressmaking in general, the importance of UK production (his fabrics are manufactured by British textiles company Makower), dogs, Northern Soul, and because we're all British - the weather. His dog - a Springer Spaniel/Labrador cross - was the loveliest, most gentle dog I've ever come across and Mr Hemingway himself as friendly and charming as I'd always imagined him. He's also from Lancashire so I may be a bit biased! 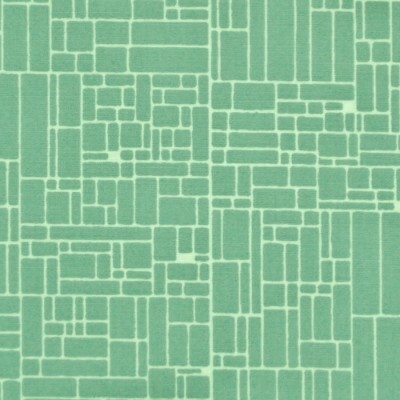 You can see more of the Hemingway Design Fabrics here and here. And no, I'm nothing to do with his company, I just happen to like the fabrics. Earlier this month, after a long summer of reduced stitching time, I was in need of a quick make to ease me back into autumn sewing. Alice from Backstitch contacted me at about the same time to see if I'd like to review a pattern from her shop. It seemed the perfect time to try out the Colette Patterns Mabel Skirt - a simple pull on skirt designed specifically for knit fabrics. Plus, Rachel from House of Pinheiro had described wearing the Mabel skirt as being like wearing pyjamas - how could I possibly resist?! 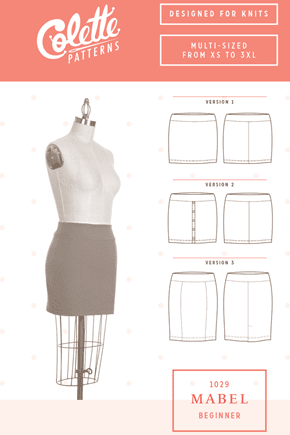 The Mabel pattern offers three design options: a mini skirt, a variation of the mini with a button placket and a pencil skirt with vent. I went for version one, the mini skirt, but lengthened it by 1.5 inches. As it turns out, it's still less of a skirt and more of a pelmet - it's very short on me and I'm titchy. So I'll be lengthening it considerably for my next attempt - probably to the same length as the pencil skirt version. There's a broad range of sizes from XS to 3XL - for reference I made a size M (US 8-10) and apart from adding a tiny bit of length, I made no changes to the pattern. I used leftover red double knit from my Victoria Blazer for the main skirt fabric and a few scraps of thinner red jersey from my easy elastic waist skirt for the waistband lining. 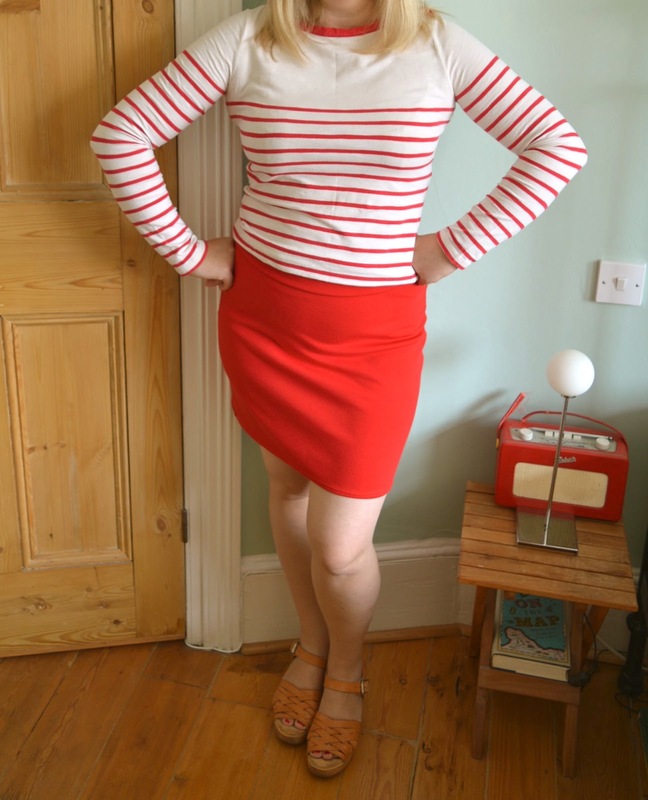 And before you ask, yes I did try the skirt and blazer on together - sadly I looked like some kind of Butlins red coat nightmare…. not a good look! Medium to heavy weight stable knits are recommended for this pattern and I think double knit is a great choice. I've had trouble with hems on knit dresses going a bit wavy in the past, but there's none of that nonsense with double knit as it's so sturdy. The pattern envelope claims that the Mabel skirt can be made in just an hour. This would have been an accurate description if I hadn't sewn the waistband on upside down. Grrr! Easily sorted though. The instructions are well written and easy to follow and the pattern was a very good choice for me to cut my teeth onto after my sewing-deprived summer. There are no fastenings, it's quite a forgiving fit (it's designed with negative ease so stretches into position if you've eaten too many pies) and even with the waistband debacle, I managed to whip it up in no time. Apart from a tiny bit of top stitching to secure the waistband and a hem sewn with a double needle, I sewed the whole skirt on my overlocker. As it's a knit pattern, a smaller ⅜" seam allowance is used throughout, which is helpful if you're using an overlocker and worth making a note of if you're not! I also liked one particular tip in the instructions telling you to trim ⅛" from the top edge of the waistband pieces to allow for "turn of cloth". This helps the shell fabric roll to the inside - it worked splendidly on my Mabel which is always satisfying! This first attempt was always meant to be a practice version but it's turned out so well I'm going to wear it until it falls apart. I have some navy blue double knit waiting in the wings for my next version. I'm well aware that almost everything I make is navy and red, but I want these Mabel skirts to be everyday basics to wear with tights in the colder months (I just got away with no tights today on this fine September day but I think that was a fluke). The way I see it, a red version and a navy version will match up with about 99% of my wardrobe. Hoorah! The Mabel pattern was given to me free of charge for review. All views my own. And now, from London, only a day later than promised, I give you the OWOP giveaway winners! Whoop, whoop! Winners of the Day One Dragonfly Fabrics giveaway are Sew in a Frenzy and Ginny from Alice and Ginny who each win a pattern of their choice. 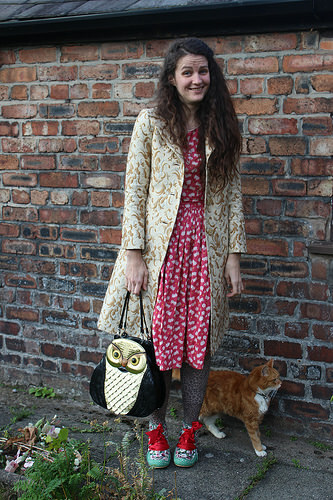 Winner of the Day Two Village Haberdashery giveaway is Zoe from Hello Zoe B, who wins three patterns of her choice. Winner of the Day Three Sewbox giveaway is Clarinda Kaleidoscope, who wins three patterns of her choice. 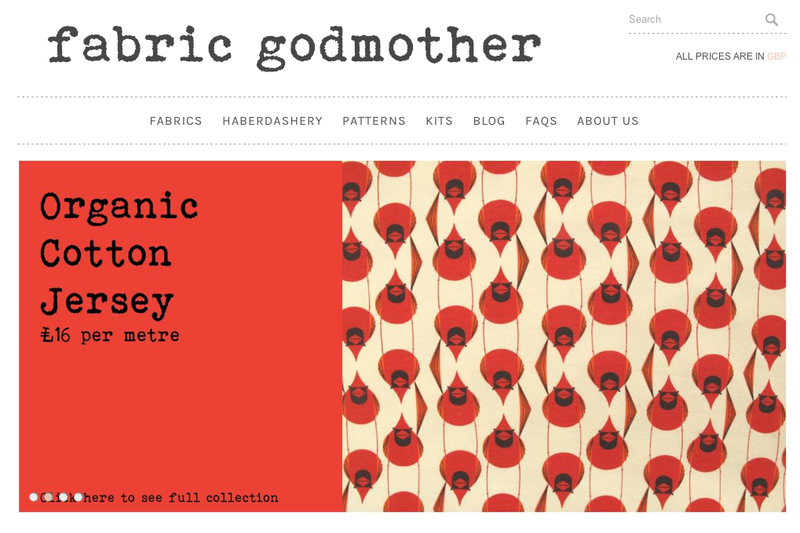 Winner of the Day Four Fabric Godmother giveaway is Jennifer from Jennifer's Sewing Space who wins a pattern of her choice and £20 worth of fabric. Winner of the Day Five Sew Over It giveaway is Sharyn from Just So... who wins a complete set of Sew Over It patterns. I've read sooooo many OWOP blog posts this week, it really has been a pleasure to see what everybody's been up around the world! Happily, wearing variations of the same pattern every day for a week doesn't seem to have put most of you off your beloved patterns. Admittedly, there were a few who couldn't wait to see the back of them by the end of the week! 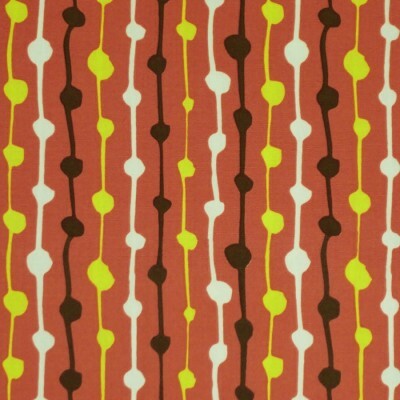 But for many of you, OWOP reiterated what it was that you initially loved about your chosen pattern, which is always nice! I've been taken aback by how creative you've been with your patterns and styling, seriously, there are some amazing outfits out there! Much as I'd like to include them all, my blog's not big enough, so here's a teeny, tiny selection of the ones that caught my eye….. 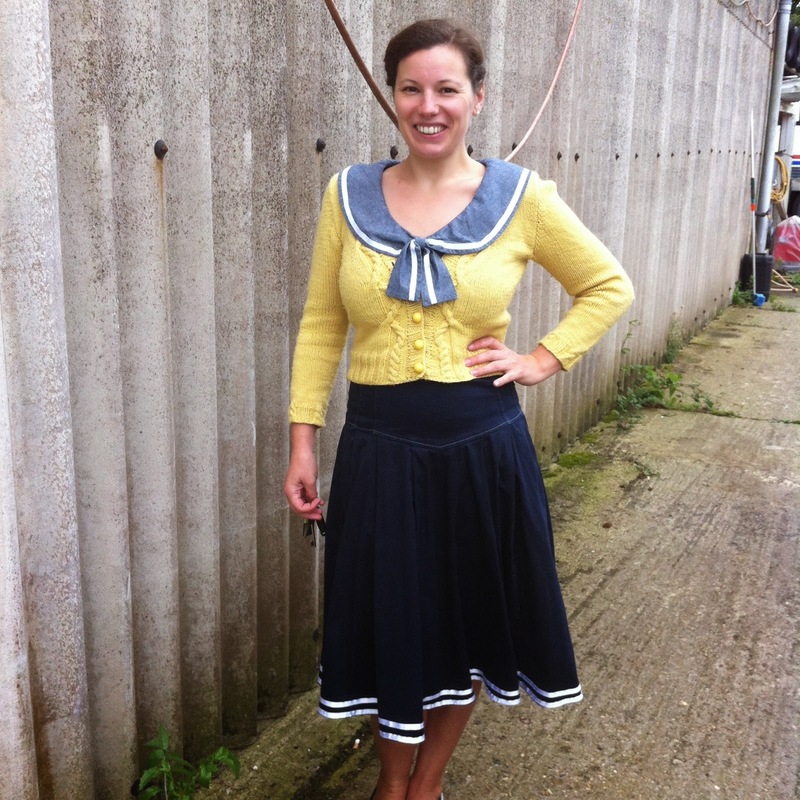 This nautical outfit from Just Sew Jenna is all kinds of awesome. The gorgeous top was created using New Look 6808 and two of her dads old shirts! 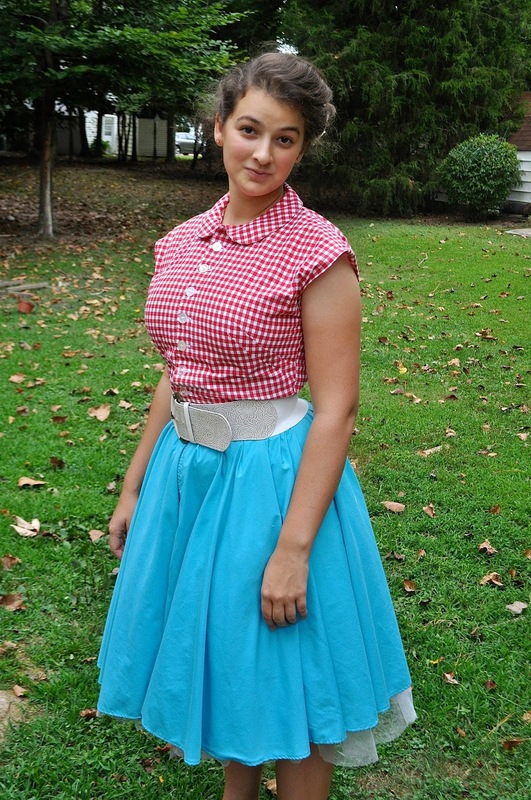 I LOVE the fifties look that Emily from To be a Woman has achieved with this dress, using the bodice from Simplicity 1460 and a circle skirt. 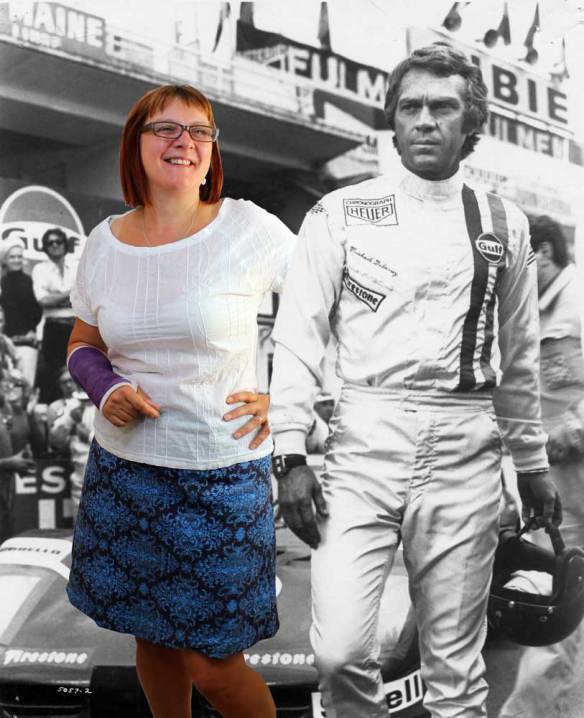 And Trixie Lixie got herself snapped with my all time favourite movie hunk - Steve McQueen - whilst wearing the Amy Butler Barcelona Skirt! "I have never liked posing for the camera and have many, many eyes shut, tongue out photos over the years to prove it! But…something has happened over this year. I have had to get used to taking photos of myself, and not just the same old me, but the me as I went through losing my hair and now my breasts. It is like photographing myself going through these stages has helped me shed the layers of self doubt and anxiety. …I am learning to make clothes and documenting the process helps me order my thoughts and solidify what I have learnt. Along the way, wonderful challenges like this weeks OWOP, where I voluntarily took daily selfies (ha!) have been incredible tools for me in finding my inner beauty." You put together some gorgeous outfits Nicki, but these two were my favourites! 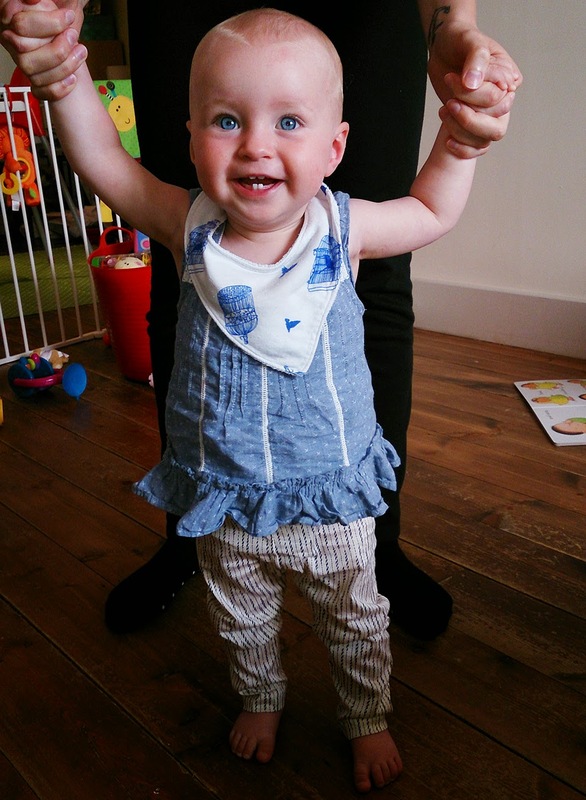 And finally, the prize for most adorable OWOP participant goes to Dolores from So,Zo...! With a little help from her mummy Zoe, Dolores totally rocked the Playful Kitty leggings pattern from Ottobre magazine. Just look at those teeth!! Day 1 - gingham Hillbilly blouse and Kelly skirt with a Vivien of Holloway belt and cherry brooch. I added the belt as the top two buttons on this skirt are a real pain. The belt keeps them in check and I love how it looks. 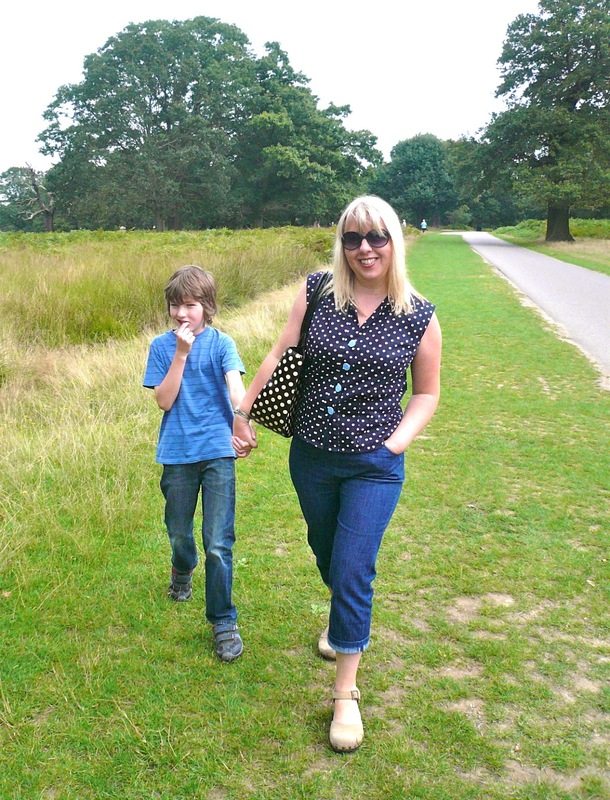 Day 2 - 1950's polka dot blouse with Gertie Capri pants, Clarks clogs (from years ago) and Kate Spade bag during a family walk around Richmond Park. Day 3 - Betty Draper blouse with red denim Delphine skirt. Everything had been very blue and denim up until this point, hence the injection of red! Day 4 - 1950's white blouse with wide-legged trousers and Vivien of Holloway belt. This was a nice outfit but I felt a bit waitressy with the white and grey combo. The belt helps to break it up a little. Day 5 - 1950's polka dot blouse and Miette skirt. I have to confess, I misjudged the weather on this day and had to perform a costume change mid-afternoon. As lovely as my Miette skirt is, it's floaty and linen and not very warm, so for the second half of the day I wore my Gertie capri pants…. and a cardi! Day 6 - Betty Draper blouse and Orla Kiely cardigan. This blouse is made from Liberty Tana lawn, so it's highly appropriate that this (slightly bonkers looking) selfie, with my lovely friend Joe, was taken outside Liberty. We couldn't believe the extortionate prices on that flower stall!! 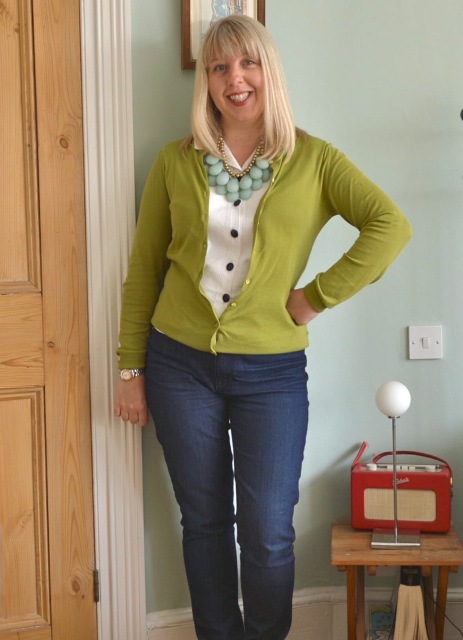 Day Seven - 1950's white blouse with green John Smedley cardigan, Anthropologie necklace and Gap jeans. I fancied a bit of unexpected colour for the last day of OWOP! By choosing a blouse pattern, I felt that I had a lot more styling options. I could choose skirts or trousers each day - what a luxury! Fabric choice definitely plays a big part in the success of the garment. The two versions made with top quality fabrics (the 1950's polka dot blouse and the Betty Draper blouse) still look virtually brand new. Sadly the same can't be said for the gingham Hillbilly blouse, which may have to be retired soon as the shoddy fabric is struggling to look good. I love having a gingham version though, so I'll just have to make another one! My 1950's white blouse is not made from a practical fabric. It's almost impossible to get the creases out so it was a bit of a pain to wear to be honest. Plain white blouses are infinitely practical however, so I'm quite tempted to make a second white one in a more everyday fabric. I'm never going to be that adventurous with accessories, but I did discover a really useful belt in my wardrobe this week and got to try out a new colour combination. This was the green/turquoise combo on the last day, slightly inspired by this picture on Pinterest. And finally…. 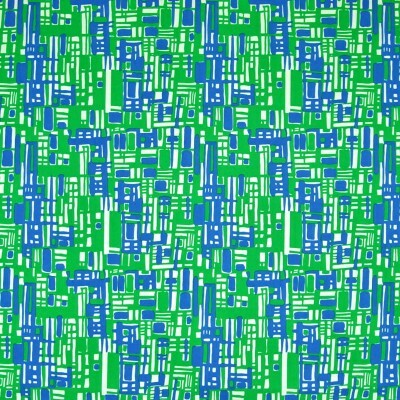 I still like the pattern! As we all know, you can sometimes have too much of a good thing, which is what I was afraid might happen over the week. Luckily it didn't, I still love all the vintage details on this pattern and it's very flattering. I've already got plans for a few more versions of it. But how did you get on? I'd love to read about your own reflections on OWOP, so if you've blogged about your week or have a photo set, please leave a link in the comments section of this post. If you leave a link to your photos or blog, I'll assume this means you consent to me borrowing a photo or two for the round-up post - or if you'd rather I didn't, just say so in the comments. …yes, this post has NOTHING whatsoever to do with One Week, One Pattern! And lots to do with my new sewing table. Ooooh! As I've written about before, I'm lucky enough to have a separate room in which to sew. It's our loft room so it also has to double up as a guest bedroom and, more recently, it's had to triple up as a home office. Previously I used the large computer desk for my sewing and had my sewing machine living by the side of it. I hauled it onto the desk when I needed it and it went back to its spot at the end of the day. I had to go through the same rigmarole with my overlocker too. A tidy solution, but a bit tiresome. Recently my husband has been doing more work at home and needed to colonise the desk more frequently - the time had come for me to sort out my own dedicated sewing table. The shelves above the main desk were staying exactly the same i.e. filled with all my sewing crap fabric/patterns/notions, so all I needed was a new table. I trawled my way through local junk shops looking for something to announce itself to me, but nothing did. Until I spotted this gem on eBay. An original 1950's melamine table with a gingham top! I loved it on first sight - it's like a table version of Dorothy from The Wizard of Oz. I can now have my sewing machine AND my overlocker out on display at the same time, which saves a massive amount of time. 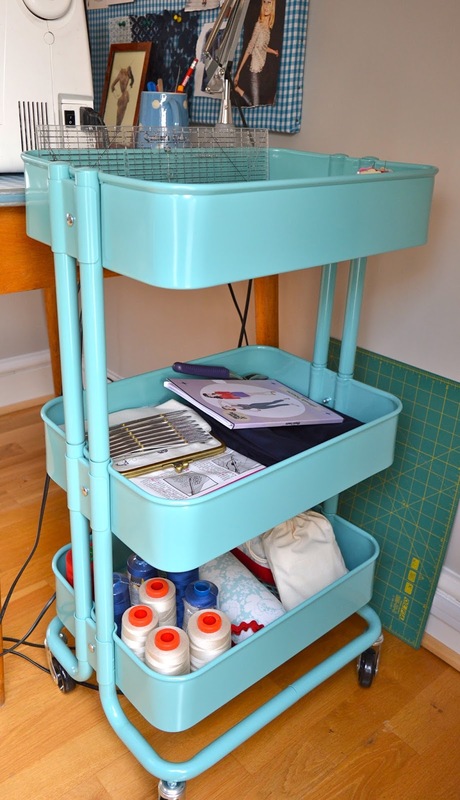 Even though I still have the shelves above the main desk, I did need something to put all my day to day stuff and ongoing projects in, so I went for the sewing bloggers' favourite - the Raskog trolley from Ikea. My new sewing area is in a nook under the roof and doesn't get as much light as my previous desk. An angle poise lamp, trained straight onto my sewing machine was a good solution. I now also have a real life pin board for the first time in my sewing life. This won't stop my Pinterest addiction, but it is handy for pinning inspiration and ideas and having them right in front of my eyes. The pin board is a cheap one from Argos that I covered in blue gingham to match the table. Actually, that's a lie, I didn't do anything. I just stood around like a lemon while my husband stretched the fabric over the pin board like a canvas and nailed it into submission. Thanks Jon! 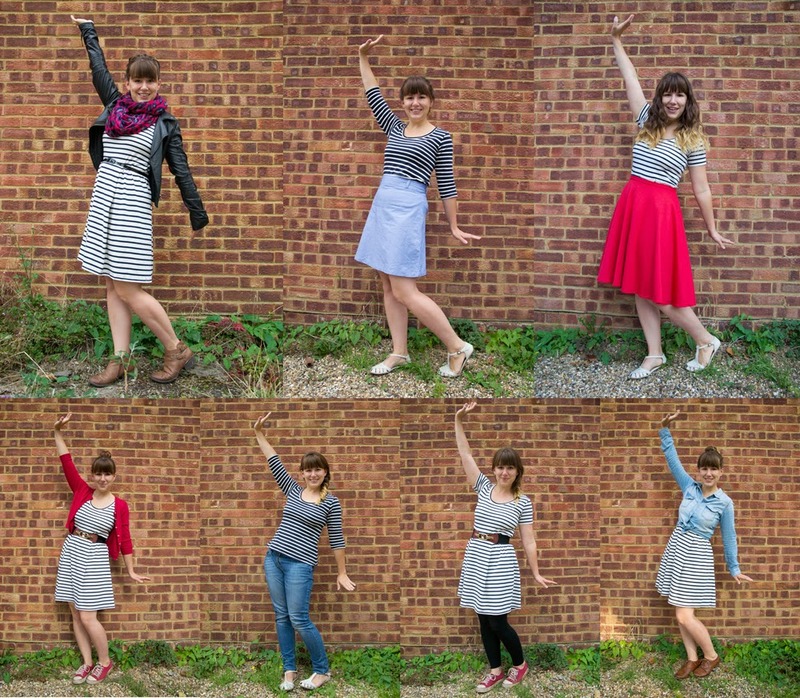 Today is the fifth and final day of One Week, One Pattern giveaway week and I have a real belter for you! 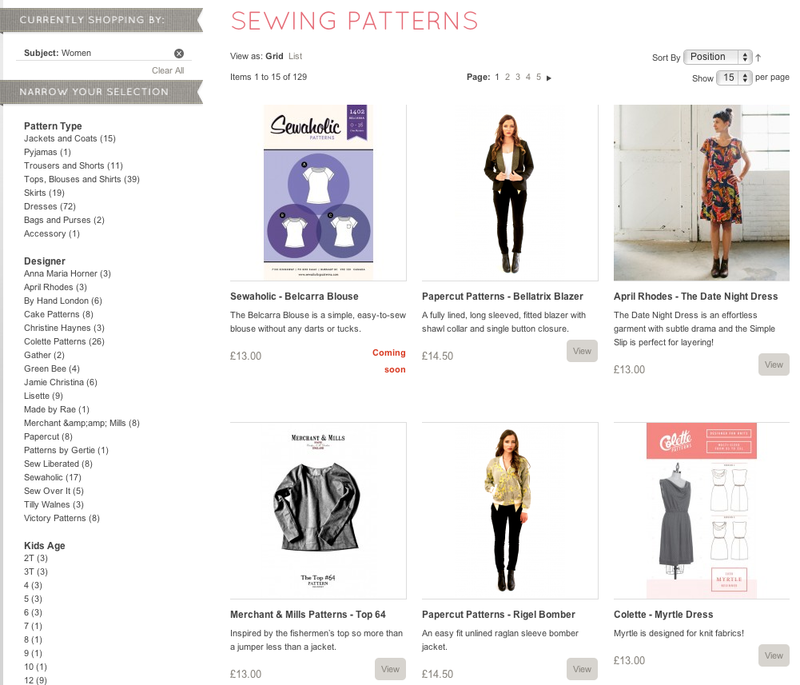 London sewing class cafe and purveyor of fine dressmaking patterns, Sew Over It, is offering one extremely lucky winner a complete set of its five paper patterns. The set comprises the Ultimate Wrap Dress, Betty Dress, Ultimate Trousers, 1940's Tea Dress and Ultimate Shift Dress as well as a digital copy of the new PDF pattern, the Silk Cami! All I can say is WOW! I can't vouch for all the patterns but I have made the Betty dress here, which was a roaring success and I'm currently at the cutting out stage of making a pair of Ultimate Trousers. So far, so good! To be in with a chance of winning, simply leave a comment on this post. The giveaway is open internationally and closes at midnight GMT on Thursday 18th September. The winners will be announced on this blog on Friday 19th September. Please make sure you leave your email address if it's not linked to your Blogger profile so I can contact you if you're a winner. I hope you've all enjoyed this bumper week of OWOP giveaways and I'd like to say an ENORMOUS thank you to my sponsors: Dragonfly Fabrics, The Village Haberdashery, Sewbox, Fabric Godmother and Sew Over It for being ssooo generous with the prizes. Good morning! It's day three of One Week, One Pattern giveaway week and today we have a super generous prize from Sewbox. Well known for their great selection of Liberty print fabrics, Sewbox also has an impressive array of patterns to choose from. They stock a great range of indie sewing designers, plus a good selection from Hot Patterns and a massive selection of Kwik Sew patterns. Phew! And guess what? One lucky winner gets to win three patterns of their choice! The full range can be found here. To be in with a chance of winning, simply leave a comment on this post. This week I'll be posting a daily giveaway in celebration of One Week, One Pattern. Today's giveaway is kindly donated by The Village Haberdashery. 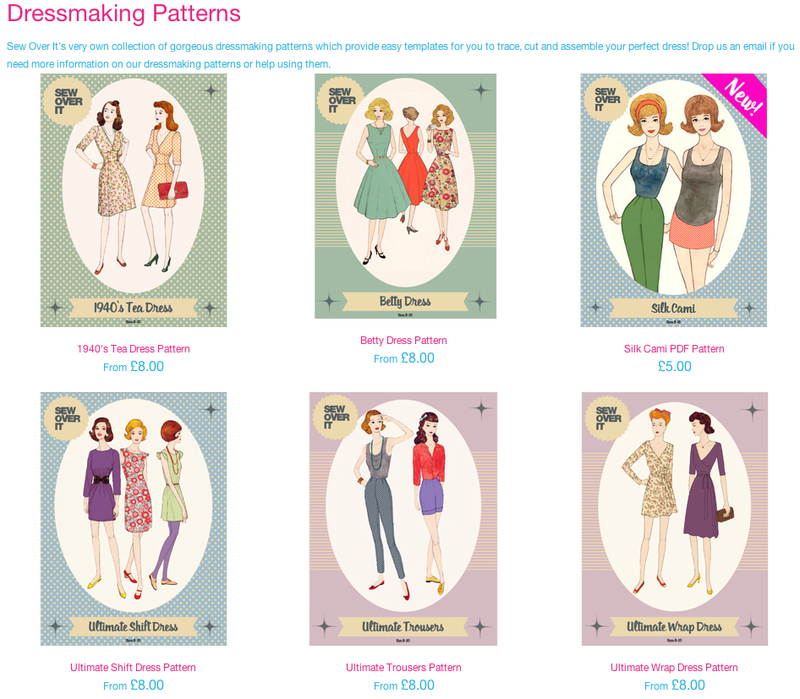 The pattern section at The Village Haberdashery is super impressive with a lovely range of contemporary and vintage-inspired dressmaking patterns from indie designers. They also stock a good selection of patterns for baby and children's wear, as well as quilting patterns. Owner Annie is very generously offering one lucky winner the chance to select three patterns of their choice! Whoop whoop! Hop on over and have a look at the full selection, which can be found here. To be in with a chance of winning, simply leave a comment on this post. The giveaway is open internationally and closes at midnight GMT on Thursday 18th September. The winners will be announced on this blog on Friday 19th September. Please make sure you leave your email address if it's not linked to your Blogger profile so I can contact you if you're a winner. Good luck everybody! First off, a big thank you to everybody who left suggestions and information about my mystery fabric roll. I was on holiday when the post went out and didn't expect much interest, so it was very gratifying to read so many useful and interesting comments - thank you again! 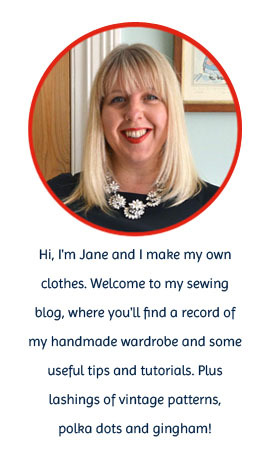 In other news, excitement mounts as sewing bloggers all over the world gear up for One Week, One Pattern! We're now just days away from the start and at the last count, nearly 200 of you had signed up for the challenge! 200!!!!! I think it's only fair that we celebrate such dedication to your much-loved patterns with PRIZES! Today's giveaway is courtesy of Dragonfly Fabrics who are very kindly offering two lucky winners one pattern each of their choice. 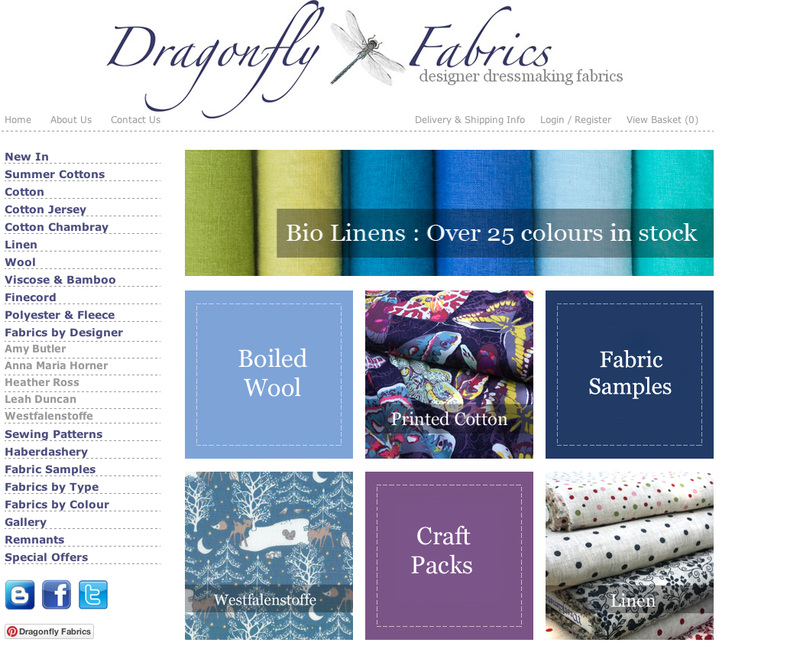 Dragonfly stock a great range of patterns from both established and up-and-coming indie designers and their full selection can be found here. To be in with a chance of winning, simply leave a comment on this post.